As online courses have become more of an alternative to the traditional classroom environment there’s a need for exploring methods on how to evaluate these online courses and their learning objectives. The intent of this research paper is to determine how we can improve online student grades so that failure rates are not 100% higher when comparing them to students attending a traditional campus course and also reduce the rate of late assignments and dropouts. This writer will identify the causes of these three areas and look at various methodologies and evaluation processes to rectify the situation. This writer will use surveys, course evaluations and quantitative and qualitative methods of data collection to determine the causes and recommend changes. The failure rate for adult online students was 100% higher on tests and assignments when comparing failure rates to the traditional campus student records. The purpose of this study was to determine some causes as to why adult online student failure rates were higher than the traditional campus. Methodologies were reviewed and evaluations of courses were conducted to determine areas where the online learning experience may be improved and in so doing lead to the realization of higher grades for the adult online learners. The school district was comprised of the 24 colleges and the adult online educational program was offered throughout the province. The number of teachers teaching traditional classes totaled 5,400 within the community while the total number of teachers teaching adult online classes within the community was 1200. There was 2000 tech support staff for the community of 24 colleges, 400 of whom were dedicated to adult online education as not all colleges offered online courses. To provide the reader with a visual display as to background of the educational level that adult online students had within the community a chart has been prepared. The following chart is a compilation of the data that have been collected over the last five years (2001 to 2005) pertaining to the educational level of adult online students. This information has varied from year over year, but the chart shows the average. 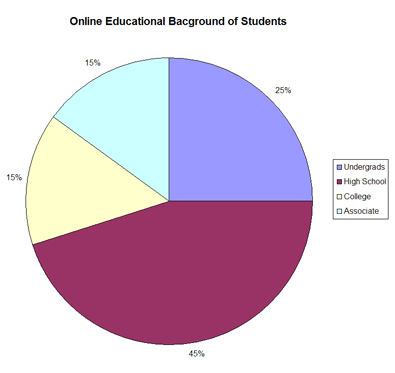 As the above Figure 1 illustrates that the largest segment of adult online learners is comprised of high school students at 45% followed by undergrads, which constituted 25% then college and associate students at 15 % per segment. The reader has to use caution however not to draw any immediate conclusions as to the age of these students even though the majority of students had high school it does not necessarily mean that they were young. That is why we have also prepared a chart to show what the age groups were of participants in the adult online educational programs. The ages of these students were of particular interest as it helped to further understand the profile of an adult online learner. The greater the amount of information that we gathered with respect to participants, the greater the chances that we were successful at identifying the causes of the high failure rates that were occurring in the adult online learning environment. 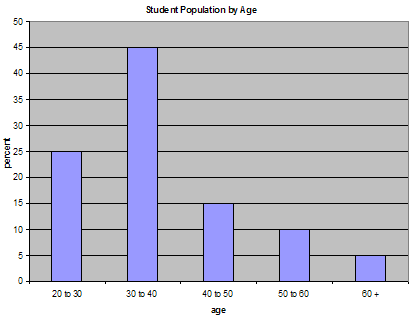 Figure 2 provide the reader with a visual display as to the age groups that were attending adult online education courses and the respective percentage of each group who attended these courses within the community. As the graph so readily indicates the two major age groups were those falling in the 30 to 40-age bracket, which totaled 40%, followed by the 20 to 30 year olds, which totaled 25% of the total adult online students. The 40 to 50 age group constituted 15 % of the total while ages 50 to 60 constituted 10 %, and age 60 and over constituted 5%. The online student environment provided for a multicultural student base. The number of students in an online class was limited to 25. As this was an adult online learning environment students who attended online classes would receive information with respect to their course and the information was coordinated and administered by staff at the main campus, however, the individual professors were located anywhere within the province or elsewhere in the country for that matter. Students logged on to the main classroom environment to receive instructions from their respective professors. Their professors gave assignments and students completed their assignments within specified timeframes. The students downloaded the necessary documentation and course material. Students had the ability to interact with their peers through the use of chat rooms. Students had access to an electronic library system for research purposes. The enrolment in adult online courses at the college was staggering since its inception. In the year 2001 enrolment for adult online students at the college was only 3000; in 2005 enrolment in the adult online student program had surpassed the 20,000 mark representing a growth rate of over 670%. This writer’s role at the campus had been to teach a number of business management and online marketing courses and website design classes to adult students. The writer had taught at the collegial level for over eight years and had also taught high tech software applications not only in an academic setting but in a business environment as well. The writer also taught advanced software applications throughout North America, Europe and the Middle East, which provided the author with the necessary credentials to undertake this research project. In light of his experience he was approached by the head of the faculty of business to see if he would consider the overseeing of a research project where the writer would be directly involved with adult online students, a number of adult online educational teachers, the technological support staff and key senior administrative personnel in the process to help determine some of the causes of the problem. He was responsible for coordinating and consolidating the information that they gathered. In 2001 our college started offering the adult online educational program, which was a new undertaking for us. The problem was since 2001 our adult online students were receiving failing grades at a 100 % higher rate than students attending courses at traditional campuses. 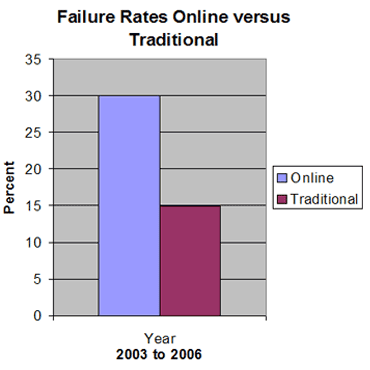 The failure rate was 30% of all online students. These figures were a true representation of our college as we had monitored the failure rates of online students from the inception of the program. The province also published the above statistics with respect to failure rates annually for all respective colleges and our figures were comparable to theirs. The failure rate numbers covered the years 2001 to 2005 inclusively. Our online student population over the past five years had risen from 3,000 students in 2001 to over 20,000 by 2005, and a failure rate of 30% of the total number of online students was simply unacceptable. As a college we were forecasting a further rate of growth of an additional 30% for the online student program over the next three years. To address this problem over the last couple of years the college had undertaken to form ad hoc committees to study the reason(s) as why this phenomenon was happening yet it had not arrived at any definitive conclusion as to what was causing the problem. It was now time for the college to commit to a formal research study as the severity of the problem of failure rates for online students would only continue and intensify given the forecast of growth in the online student program over the next three years. A different strategy was obviously needed and a specific group of professionals were chosen and dedicated on a full time basis to determine the reasons and to structure an action plan based on their findings to resolve this issue. Provincial reports for the last two years, which were just recently published, had shown that adult online students were receiving failing grades. In fact, the figures indicated that in comparison to the students that attended courses at a traditional campus the online students had a 100 % higher failure rate or an actual rate of 30% in the total student population. The reason why our college figures mirrored those of the province is that we are the largest of all the colleges in the province therefore our figures matched the provincial statistics with a margin of error less than a quarter percent. Yet in another publication, which was reported in May of 2006, by independent researchers the numbers found that over the last five years withdrawals from courses were 100% higher for adult online students or in total 20% of online students withdrew. When comparing the 20 % rate to that of withdrawals in the traditional campus environment the failure rate was only 10% in the traditional setting. Once again, to understand this and the magnitude of the problem all one had to do is to refer to an example using a class size of 30. The 20% withdrawal figure in a class size of 30 in an online class equated to 6 students withdrawing while only 3 on average withdrew in a traditional campus setting. The difference was twofold. In the spring of 2006, a report issued by the province, found that adult online students were handing in their assignments late on a regular basis. When assignments were totaled for 6 different types of adult online courses it was found that 25 % of all the assignments that were due during the duration of the course were submitted late. The number of late assignments handed in for six similar courses by students attending a traditional campus totaled 5%, a staggering difference of 500% when comparing the two classroom settings. The provincial government was in the midst of further analyzing the demographics of the information being collected, as there was reason to believe that these figures reflected that the learning object repositories being used could play an important role within different cultures and communities. This insight was relatively new; however it did have an impact on course objectives and a significant impact on participants of different cultures attending adult online learning courses. One other observation, which was also included in the report issued by the province, was that adult online students were found to infringe on copyright material. This infringement takes place amongst 10% of the total students attending adult online classes while the rate for copyright infringement for students attending classes at a traditional campus was 5%. Figures 3, 4 and 5 depict all the relevant information that has been discussed. The charts cover the 2003 to 2006 period and focus on the failure rates, withdrawal rates and the late assignments with respect to adult online students. One article chosen for review was “Evaluating Learning Objectives Across Boundaries: The Semantics of Localization.’’ This article discussed how both learning object repositories and evaluation tools played an important role within different cultures and communities. By focusing on learning objectives, which are retained in a web-based repository, the information becomes more readily available. The article went on to state, “ Within the next five years, the U.S. National Science Digital Library (NSDL) is predicted to grow to include as many as 100,000 collections representing over a million learning objectives” (Saylor, 2002). It was mentioned in the article that learning object repositories provided few opportunities for interaction among expert reviewers such as content experts and instructional designers but in addition the repositories offered little interaction amongst the end consumer reviewers those being the teachers and learners. As a result of this lack of interaction, a web site named eLera was designed in September of 2002 to support a distributed network for teachers, instructors, students, researchers, developers and designers which provided them with a repository that stores metadata which points to learning objective quality reviews and not just the learning object itself. “ELera supports collaborative evaluation of learning objectives, specifically the convergent participation model defined and tested in previous research (Nesbit & Belfer, 2004; Nesbit et al., 2004; Vargo et al., 2003).” The model referred to was comprised of a small team of participants, which was generally composed of a subject matter expert, a learner, and an instructional designer. Team members discussed and reviewed their individual evaluations and discussed with other members of like interest their evaluations. There are many aspects, which needed evaluation with respects to online courses. Hara and Kling (1) found in their study of students in an online class that students sent more than the required e-mail messages, also students didn’t seem to read course materials or other student messages before sending e-mails to the entire class. Hara and Kling also found that students had difficulty with group projects, time management and scheduling, and access to computers. In a article written by Marold in the Journal of Information Technology Education (Vol. 1 No.2 2002) she stated that to better understand changes in technology we should employ McLuhan’s “rear view mirror” approach (1964). There was a wealth of research transcending all disciplines to give us a foundation from which to understand electronic learning. It was this “rear view mirror” that allowed us to see where we were by examining where we had been, in essence, this was the approach which was taken when considering evaluation methodologies. One cannot improve an online learning evaluation process and the course objective without using this method. To give the reader an idea of just how much the online learning environment will grow in the next few years Callahan (2003) noted at a UCEA conference that the current higher education infrastructure cannot accommodate the growing college-aged population and that the largest high school class in U.S. history will occur in 2009 making distance education programs necessary. Enrolment will grow over 16% in the next ten years (Jones, 2003). Reeve and Perlich, projected similar college enrolment rates for the state of Utah and added that, “Because college and university attendance are not restricted to this ‘Traditional’ age group, this represents only a partial measurement of the projected demand for higher education” (Reeve & Perlich, 2002, p.3). With this growth in college-age population and enrolments coupled with the need for lifelong learning for adults many institutions have come to realize that they there will be more students than their facilities can accommodate (Oblinger, Barone, & Hawkins). To support the argument that drop out rates were higher for online students we relied on information collected by educators who continued to report course drop out and failure rates among distance learners that were significantly higher than those for traditional, campus-based students (Carnevale, 2000b; Carr, 2000; Pierrakeas, 2004; Scalese, 2001; Simpson, 2004; Tresman, 2002; Wojciechowski & Palmer, 2005). The issue of student retention and completion rates in distance education has been investigated and vigorously argued over for at least the last seven decades (Berge & Huang, 2004). This discussion had intensified since the introduction of eLearning and its progression from the periphery of mainstream and earlier modes of distance education and training to a more central role (Berge & Huang, 2004). Some had reported attrition from eLearning as high as 70 - 80% (Flood 2002, Forrester 2000, in Dagger & Wade, 2004). Parker (1999) argued, “With the growth of distance education has come the problem of exceedingly high attrition rates”. Carter (1996) suggested that eLearning student attrition in some institutions exceeded 40%, while others (Frankola, 2001; Diaz, 2002), put it at between 20 - 50% and Carr (2000), and estimated it to be 10% - 20% higher than for traditional on-campus education. Researchers acknowledged that the reasons for attrition are many and complex and that there were no simple solutions. (Berge and Huang, 2004). While a growing body of research was seeking to address the issue (Parker,1999;Frankola, 2001; Diaz, 2002, McEwen and Gueldenzoph, 2003; Martinez, 2003; Wang, et al 2003; Rossett and Schafer, 2003; Berge and Huang, 2004’ Simpson, 2004), little of this research considered the learner’s experiences or point of view (Rossett and Schafer, 2003). The research was particularly scant on the direct experience of ‘first-time eLearners’ or how the first impression of eLearning might impact on a learner’s decisions to persist, or to abandon online study. Still, a common criticism of distance learning was the lack of personal contact and immediate instructor feedback that some students prefer (Brown, 1996; Carr, 2000; Garland, 1993a; McGivney, 2004; Minich, 1996). One of the most frequently stated reasons for dropout was the sense of isolation experienced by students studying off campus (Galusha, 1997; Garrison, 1987; Gibson & Graff, 1992; Heverly, 1999; Kerka, 1995; Ludwig-Hardman & Dunlap, 2003; McCracken, 2004; Pugliese, 1994; Sweet, 1986; Wojciechowski & Palmer, 2005). To further illustrate the above that a lack of personal contact had an adverse affect on students enrolled in an online learning environment there was an article that appeared in the Canadian Journal of Learning and Technology in the spring of 2004 where the authors Murphy and Coleman discussed the challenges encountered by students in an online course. In particular the four areas being looked at were: student behaviour, text-only online communication, purpose and quality of the discussion and forum features. In regards to text-only online communication Oliver and Shaw’s (2003) investigation of strategies for encouraging student participation in discussions identified and explored facts that encouraged and inhibited student participation. In their analysis of the patterns in postings, they found that “students were playing the game of assessment, making the posting that earned the most marks but rarely contributed otherwise” (p.64). The findings discussed in the article were the findings done in a study by Coleman in 2004 which involved the barriers and challenges encountered by online students completing their masters-level web-based program. With respect to communicating, participants referred to being “very alone” and feeling discouraged from participating when others excluded them from the conversation. One participant found that this exclusion had a definite impact on his participation and stated ‘It is hard to discuss when nobody responds to your posts.” Yet another participant was quoted as saying, “I have experienced what I perceive as rude comments and have witnessed classmates getting rudeness projected at them and I find it frustrating. I think that people use the online format to be more assertive than they would be in person.” These two articles that are cited above take into consideration factors that ultimately affected adult online students and these factors consequently played a part in their academic results and all too often negatively. Students’ grades were affected especially when they were hesitant to participate as lack of involvement generally lead to lower grades and if the situation persisted withdrawal became imminent. In a research paper written by Nash at Coastline Community College located at Fountain Valley in California, he stated that other factors found to explain student attrition included general college preparation, lack of guidance and information prior to enrolment, perceived lack of support from faculty, and difficulties in contacting them (Brown, 1996; Cookson, 1989; Frew & Weber, 1995; Pierrakeas, 2004; Tresman, 2002). Other researchers have found that student characteristics such as computer literacy and confidence, reading ability, and time management skills played a role in successful course completion (Miller, Rainer, & Corely, 2003; Osborn, 2001; Powell, Conway, & Ross, 1990; Rovai, 2003). Another article, which supported the above observation states, "Much has been written about retention in distance learning courses. Authors have different ideas about what causes students to drop out of these courses. Some of the issues include lack of instructor training, poor course design, lack of student interaction, and personal commitments. Few actual studies have been done to provide evidence for these assumptions. This paper provides possible solutions to the problem of retention and offers suggestions for improvement in the entire field of distance education" (Serwatka, International Journal of Instructional Technology and Distance Learning, January 2005). In a recent article published in the Canadian Journal of Learning and Technology Vol. 32 (1) Winter/hiver 2006 entitled Optional online quizzes: College use and relationship to achievement written by Genevieve Marie Johnson she mentioned that online practice tests and quizzes were commonly available to higher education students attending online classes. In her study she had 112 college students use optional online quizzes in preparation for proctored examinations. Her analysis showed that student use of online quizzes associated with increased academic achievement, although, it was not clear according to the results that the increased achievement was caused by the quiz or alternatively if the achievement caused quiz use. Undergraduate excellence has been associated with prompt evaluation feedback (Chickering & Gamson, 1999). Because online automated quizzes provide students with immediate performance feedback (Ed Tech, 2005: Hutchins (2003) they are recommended to undergraduate students as a tool of study (Byers 1999; Jensen, Johnson & Johnson, 2002; Jensen, Moore, & Hatch, 2002; Kashy, Thoennessen, Albertelli & Tsai, 2000). In essence, what the study surmised was that the investigation explored patterns of student use of optional online quizzes and determined that there is a relationship between such use and achievement. However, questions still remain as to what motivated students to use online quizzes, which formats tended to work best for the students and how the use of online quizzes fits into effective study methods. As this article shows, online quizzes appeared to be an effective tool in enhancing online student achievement and in so doing addressed both the overall grades that students earned and that in effect reduced the number of withdrawals being experienced in the adult online learning environment. There were several reasons why the adult online students were receiving failing grades such as students were not submitting their assignments on a timely basis which had an adverse effect on their grades as they, the students, were penalized for submitting late assignments. The cause of late assignments was due to the fact that teachers were not equipped for teaching students who did not have a proficiency in the English language and that the students simply did not understand the directions that were given to them and as a result their assignments were turned in late. This cause had been documented for students attending both traditional classes and adult online classes, yet it became a much more important factor for the online students, especially those who were auditory learners. The auditory online student was at a distinct disadvantage as the directions were only given in writing in an online environment, the lack of having an auditory device available had a negative impact on their grades, as they simply did not understand what was required. Another reason for online assignments being late was that adult online students had not participated in a time management course, a requirement that is mandatory for students who attend courses at a traditional campus. By not having attended a time management course it also presented the adult online learners with a challenge in that they were unaccustomed to prioritizing their assignments. When reviewing the profiles of students it was observed that most students who were attending the adult online course were doing so for the first time. Lack of familiarity with the online learning environment appeared to be having an affect on the students when it came to submitting assignments as they were struggling with the process as evidenced by their failing grades. All too often-online students posted to the wrong location and not to the folder where the assignment should have been posted. This was related to the fact that the college did not have an introductory session to acquaint students with the online environment that they would be using. A further observation of the adult learning environment revealed that adult online students were not receiving feedback on their prior assignments on a timely basis. This was a very important issue as well, as it affected the students’ ability to complete subsequent assignments and it negatively affected their grades. It is important for the reader to understand that the deadlines for assignments were very tight and there was virtually no room to manoeuvre. If a student received his grade a day late he/she may very well not be able to meet the next assignment deadline as there were only a couple of days between assignments. The cause of students not receiving feedback in a timely manner was a direct result of class size. Teachers had a class size of 25; when comparing this figure to other educational facilities, the class size for a typical adult online course was limited to 20 students at the most. By reducing the class size the teacher would be given the opportunity to grade and distribute the assignments to the students on time, thereby allowing the students the appropriate amount of time for their next assignment. Students were also having difficulties with the adult online learning environment with respect to software. There had been several incidences reported which involved online students misunderstanding the software and this misunderstanding had also played a role in the adult online environment as they spent time getting up to speed in understanding such software packages as Microsoft Word or Excel which were used to complete assignments. The time spent in learning these software packages throughout the semester was obviously taking away time from their online course reading requirements, thereby, leaving a very limited amount of time to complete their assignments. The primary goal of this research paper was to ultimately suggest both a method and a process, which would improve the grades of the adult online student population so that their grades would match if not exceed the grades that were being obtained by students taking similar courses at a traditional campus setting. Two other factors that would also be reviewed and improved upon would be the withdrawal rates of adult online students and their percentage of late assignments as compared to students attending similar courses at a traditional campus. These two rates were expected to decrease and fall below the rates that were being experienced by students at the traditional campus setting. The process would involve the designing and implementing of a research based strategy, which would lead to the following expected outcomes. There would be more adult online students who would receive passing grades on tests as the current adult online failure rate of 30 % would be expected to decrease to 15% to match the rate being experienced by assignments students attending similar courses at a traditional campus. 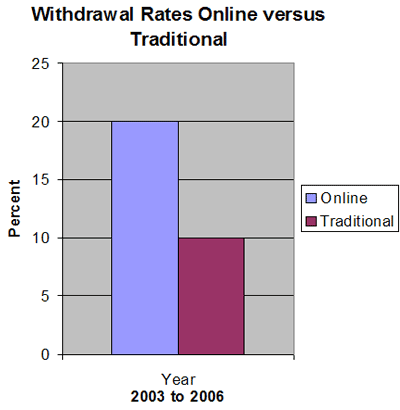 There would be fewer adult online student withdrawals, as the current rate for withdrawals of adult online students would be expected to fall from the current rate of 20% to match the 10% being experienced by students attending similar courses at a traditional campus. 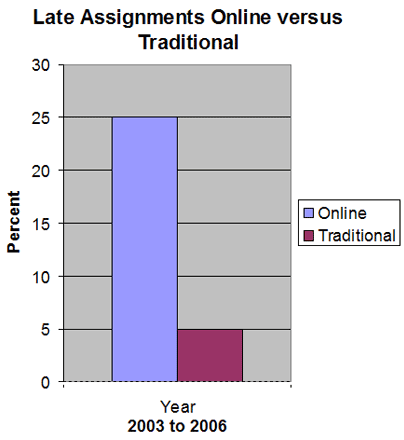 The late assignment rate of 25% currently being experienced by adult online students would be expected to at least match the 5% late assignment rate being experienced by students attending similar courses at a traditional campus as assignments would be stated in a more concise manner and students would be reminded of deadlines on a more frequent basis. To determine the success of the project both quantitative and qualitative methods were used. Students were pre-tested for knowledge of software prior to enrolment to online courses. Students were pre-tested for fluency in English prior to enrolment to online courses. Feedback on assignments was assessed to determine if the feedback was returned to the students on a timely basis during each semester. Students completed course evaluations at the end of each semester. Students were pre-tested with respect to their time management skills prior to enrolment in an online course. Course evaluation results were distributed to the teachers and administrators of the college for review and comment. Results of student grades were published and given to both the teachers and administrators for review. Teacher interviews were conducted on the completion of a semester and findings submitted to the Board of Directors for review. Senior administrators were interviewed on a quarterly basis and findings submitted to the Board of Directors for review. Technical support people were interviewed on a quarterly basis and findings submitted to the Board of Directors for review. Student survey results for each semester were submitted to the Board of Directors for review. The student surveys completed each semester were the basis of a report to show how the 3 types of learners did with respect to their grades with an emphasis on auditory students. The adult online student test results for student fluency of the English language. The adult online adult student results for their test regarding their knowledge of the software being used. Other faculty member comments given during the quarterly interview process will be shared with all involved. Results of the final grades for the adult online students and the comparison to the grades obtained by students attending similar courses at the traditional campus. The adult online student results for students that attended the time management course. The failure rate for adult online students was 100 % higher on tests and assignments when comparing the failure rates to students attending courses at a traditional campus. Good practice encourages contacts between students and faculty. Chickering and Gamson (1987) argued for pedagogical contexts that were flexible and offered a number of learning possibilities to students. Turcotte’s and Laferriere’s own pedagogical experience in the use of discussion forums, which goes back to 1996, led them to believe that the use of online conferences provided pedagogical possibilities that can prove helpful in meeting each and all of the seven principles. Online conferencing increased occasions and ways for students to interact with each other and with faculty. Discussion forums created a shared workspace for students that are conducive to collaborative work between peers. Successful online conferences required students to be active participants. Students had to question their own ideas, formulate hypotheses, suggest solutions, defend their point of view, and so forth. Chickering and Gamson (1987) stated that learning is not a spectator sport. Students learn very little by sitting still in class and listening to the teacher. By talking about what they are learning, linking it to past experiences and applying it to their everyday life, learning increases. Computer conferences offered students the occasion to participate in discussions that are more tuned to their own pace and rhythm. For instance, debates may be launched in order to obtain the opinions of persons who would otherwise remain silent. Text based communication removed barriers such as self-consciousness and other impediments to effective communication, and it more easily maintains interpersonal exchanges at the level of ideas (Harasim, 1993). Excellence in undergraduate teaching was associated with prompt evaluative feedback to students (Chickering & Gamson, 1999) and they are commonly recommended to students as tools of study (Byers, 1999; Johnson & Johnson 2002; Jensen, Moore & Hatch, 2002; Kashy, Thoennessen, Albertelli, & Tsai, 2000). Online quizzes were recommended because they provided students with immediate performance feedback (EdTech, 2005; Hutchins 2003). In an article written in the Journal of Assisted Learning discussing a project called Xanadu, which had shown how, teachers’ awareness may be developed towards adopting a wide range of TEL or Technical Enhanced Learning approaches (G. Trentin June, 2006). This process enhanced the online learning environment as teachers became more knowledgeable with technology and its effects on learning outcomes. Part of the solution with respect to course design and learning objectives, which would bring all participants of online courses together, involved the designed of a specific web site named eLera in September of 2002. As stated in the article eLera helps to support a distributed network for teachers, instructors, students, researchers, developers and designers which provides them with a repository that stores metadata which points to learning objective quality reviews and not just the learning object itself. “ELera supports collaborative evaluation of learning objectives, specifically the convergent participation model defined and tested in previous research (Nesbit & Belfer, 2004; Nesbit et al., 2004; Vargo et al., 2003).” In another article written by Hara and Kling (2000) they noted that online students had a tendency to write more emails than necessary and did not read the course material. A possible solution to rectify this problem would be to develop a method, which would track student movements to ensure that they have visited the site containing the respective course material, record the time spent visiting this and the number of emails sent by each student. In an article written in the journal entitled Syllabus, Boettcher and Kumar (2000) wrote that they were beginning to understand that Web campuses did not magically appear, and that online programs were not ‘almost’ free to deliver. This article offered insight to arriving at solutions which would enhance the online learning experience by considering aspects such as the degree of experience that tech support people required, the experience that teachers were required to have to teach online courses, the commitment by the administration of the educational facility and last but certainly not least the financial resources that were required to make the online courses a success. To help resolve content issues in an online learning environment it was also imperative that both the teachers and students were aware of the copyright laws pertaining to information contained in the learning program itself or information used by the student in a research project. In an article published by CJLT the Canadian Journal of Learning and Technology entitled Off with Their Heads: Copyright infringement in the Canadian Online Higher Educational Environment, it reminded the educational community that it must carefully consider how digital materials are used, created and disseminated online given that the laws that regulate these actions are not well developed (Edmonds, 2005). To develop strategies to reduce early dropouts Salmon (2004), a noted expert in online moderation and facilitation, makes a number of useful and practical suggestions about inducting online learners. In particular, she identified the need to limit the amount of content specific information and activity in the early stages, and to focus on activities (E-tivities) that promoted the formation of an individual’s identity online, the development of learning group cohesion and the setting of group norms, expectations and the rules around online discussions (p.197). She also advocated the simplification/ limitation of navigation options early on and releasing the content as learners gain mastery with some of the basic skills. This would have the effect of reducing some of the cognitive overloading that learners experienced at this stage. It was this author’s experience in designing, developing and delivering several eLearning programmers to public sector employees in New Zealand that made a face to face workshop prior the start of the online distance course make a significant difference to a first time eLearner’s perception and experience of eLearning. The value of having the learners meet face to face and be introduced to the technology as well as using simple online ice-breaking activities that scaffold later more complex tasks cannot be overstated. This circumvents much of the angst some learners initially experienced. In addition, some introductory and meaningful discussion board activities were structured to break down the isolation, inhibitions and reluctance of some learners to engage with online conversations. This type of pre-course face-to-face induction workshop would also be used to foster the group’s sense of itself, and to identify the individual participants and their backgrounds, along with their expectations and concerns. This type of process was similar to the one adopted by the University of Phoenix. It was also helpful to have the course design, structure and philosophy explained and to discuss anxieties associated with beginning an online course. Telling learners of the complex and sometimes challenging learning tasks involved in the start of an online course lets them know that this is not something only they are experiencing. Working on the basis that being forewarned is forearmed, it was Salmon’s contention that actually apprising learners of the issues of cognitive overload and how it is commonly experienced would go some way towards inoculating learners against its more pernicious effects. In another article written by Varnhagen, Wilson, Krupa, Kasprzak and Hunting entitled Comparison of Student Experience with Different Online Graduate Courses in Health Promotion (Canadian Journal of Learning and Technology Volume 31(1) Winter/hiver 2005) the authors undertook to conduct a study to understand the experience of students as they progressed through three specific online graduate courses in health promotion studies delivered primarily by asynchronous computer conferencing. Focused teleconference discussions were conducted with approximately 45 students from the different courses and the transcripts subjected to qualitative analysis. Themes that emerged included what new students appreciated most when adapting to learning online, factors that contributed to learner satisfaction, and the difficulties encountered by students taking a course when the content was not as well suited to the instructional method. The findings are discussed in relation to the three components of Garrison, Anderson and Archer’s (2000) Community of Inquiry model of learning: cognitive, social and teacher presence. Implications were presented for assisting students with the process of adapting to online learning and enhancing the ‘fit’ between course content and online instructional methods. Some of the benefits derived which would help benefit students attending future classes included that the students felt their new online experience provided them with a significant development of peer relationships and support. Another major benefit that students appreciated was the flexibility that they could access online course information by having access to computer – mediated communication (CMC) and asynchronous computer conferencing which provides for the method of delivering programs anytime and anywhere. Students also appreciated having a greater teaching presence, as they were new to the elearning environment. The findings also reflected that overall the student satisfaction rate was high. Create a relaxed and safe atmosphere. Present information using both visual and auditory methods. Talk with students, not at them. Let students influence course coverage. Match teaching method to content. Support theory with real-life examples. Researchers have paid a substantial amount of attention to distance learner attrition, but less work had been done on specific remedies to improve the persistence of these students. While many possible solutions had been proposed, few had been tested empirically and the research that does exist is not in complete agreement. Kember (1990) and Powell et al. (1990) made the case that persistence and drop out were influenced by many different variables, many of which affect each other. So, studies that focused on single variables can be misleading or fruitless. Still a common criticism of distance learning is the lack of personal contact and immediate instructor feedback that some students preferred (Brown, 1996; Carr, 2000; Garland, 1993a; McGivney, 2004; Minich, 1996). One of the most frequently stated reasons for dropout was the sense of isolation experienced by students studying off campus (Galusha, 1997; Garrison, 1987; Gibson & Graff, 1992; Heverly, 1999; Kerka, 1995; Ludwig-Hardman & Dunlap, 2003; McCracken, 2004; Pugliese, 1994; Sweet, 1986; Wojciechowski & Palmer, 2005). In a study of a video-based distance-learning program (i.e., telecourses), Towles, Ellis, and Spencer (1993) showed that faculty-initiated contact (via phone calls) improved course completion among freshmen students. Minich (1996) recommended that faculty initiate contact earlier and more frequently with students, perhaps with an electronic bulletin board system (i.e., asynchronous discussion). Catchpole (1992) argued for more faculty-student contact in DL environments, and Simpson (2004) described the benefits of "proactive contact." But these interactions can be time-consuming and difficult for faculty to sustain, especially with larger class sizes. An option that provided similar benefits was supplemental tutoring, which included assistance with specific course assignments or more general training in prerequisite skills (Castles, 2004; Lentell & O'Rourke, 2004; McCracken, 2004; Miller, 2002). To augment services offered by the instructor of record, supplemental tutoring was provided by paid faculty, subject matter experts, and/or trained peer tutors, either on campus or via technology (filling the role of a learning/tutoring centre on a traditional campus). As Galusha (1997) explained, "[Distance-learning] students need tutors and academic planners to help them complete courses on time and to act as a support system when stress becomes a problem" (p. 4). Sweet (1986) and Rekkedal (1985) have mentioned the benefits of tutors in distance education, although "tutors" in the Open University model are often faculty who combine administrative, teaching, and counseling functions (Keegan, 1981). In addition to supplemental tutoring, some educators had recommended pre-course orientations to help manage students' expectations and generally prepared them for distance learning (Bååth, 1984b; Carnevale, 2000a; Carr, 2000; Chyung, 2001; Cookson, 1989; Hammond, 1997; Kember, 1990; Kerka, 1995; Ludwig-Hardman & Dunlap, 2003; Rovai, 2003; Ryan, 2001; Scalese, 2001; Tresman, 2002; Wojciechowski & Palmer, 2005). These orientations described the specific demands of a particular course. They also provided instruction on general study approaches and the technical skills necessary for success. For instance, Dupin-Bryant (2004) and Hyung (2001) showed that computer training was positively related to retention. In another example, an "online boot camp" offered by Boise State University (mandatory for first-year online students) improved completion rates by 20 to 40 percent per class by running students through drills with the course delivery software and allowing them to chat informally online before their course began (Carnevale, 2000a). Orientations were held online or on campus. In the Minich study, 68% of student respondents said their on-campus orientation was conveniently scheduled, and only 7% said it was not helpful. But, given that these students had chosen distance learning to avoid having to come to campus, some institutions were beginning to offer their student services-including orientations-at a distance via technology (Boehler, 1999). Research offered many interrelated factors that influenced distance learner attrition and persistence. Most of these (such as illness, academic background, and job demands) were out of the institution's control. With that in mind, this study focused on controllable factors such as student skills and expectations as well as specific responses to those factors such as supplemental tutoring and pre-course orientations. Of course, one cannot presume that students used these support services if they were offered. For instance, Holmberg (1995) made a case for two-way communication as one of the "constituent elements" in an effective DL program. However, the use of these services had often disappointed educators. "Communication initiated by students and based on questions that they raise and want further comment on along with suggestions for further reading, implementation, and practice, would seem very desirable. However, few distance-study institutions have managed to inspire more than a minority of their students to make use of this facility..." (p. 107). Students were given more online quizzes as evidence has shown that by using this technique student scores have improved. Students were pre-tested to ensure that they had the necessary knowledge of software being used in the course. Students were pre-tested for their fluency in English. Students received prompt feedback of their assignments as evidence has shown that this method improved retention of the material. Students completed online course evaluations at the end of each course. Students had to attend a time management course prior to enrolling. Both students and teachers were tested on their knowledge of copyright laws. Students were required to read the course material at the site location. Teachers and tech support were ensured that there is a capability to monitor student movements within the elearning environment to ensure that students actually visited the site, which contained the course material. Course curricula and learning objectives were redesigned and clearly stated. Feedback to students was faster so that they may complete their next assignments on a timely basis. Class sizes were reduced to 20. Videotape was designed and produced to explain the online learning process and the tape was given to all adult online learners prior to the start of their online class. This tape gave an overview of the course in its entirety, which was of particular help to the auditory and visual learners. Provided members with a copy of the student test re their fluency in English, which students must complete prior to the start of the online class. Provided members with a copy of the student test re their time management course, which students must complete prior to the start of the online class. Handed out copies of the survey, which would be distributed, to students attending the online courses to the faculty members who are teaching those courses. These surveys would be given to online students in the third week of November. Had students complete their pre-test for English and time management? Scheduled biweekly meeting at the commencement of the semester. Reminded faculty staff members that they would have to fill out forms on a biweekly basis, which would indicate the date of the assignment was due, the date the student submitted the assignment and the date that they actually provided feedback to the student. In the regularly scheduled meeting discussed with the online faculty teaching staff that individual interviews would be conducted with them during the course of the semester to get their views on how the courses are progressing. Similarly interviews would be conducted with both the administrative staff and the tech support staff as well. Collected from faculty staff members their biweekly report on assignment turnarounds. In the regular biweekly meeting notified the participants that individual interviews would commence in month three October of 2006. Handed out copies of the questions, which they would be asked in week one of October. Commenced interviews with the faculty staff members, tech support and administrators. In the biweekly meeting discussed the results of interviews with members that have been reviewed. Shared the results with other members, which would be reviewed so that they too have a clear understanding as to what the process will be like. Mentioned to all participants that a consolidated report would be circulated upon the completion of the interviews. Continued with individual interviews with the participants. In the regularly biweekly meeting informed the online teaching faculty that they would have to distribute a survey to their online students in the second week of November. Reviewed the online survey with staff to ensure that they did not have any concerns. Continued with the individual questions/interviews for the admin, tech support and online faculty teachers who had not been interviewed as yet. In the regular biweekly meeting reconfirmed that the online teaching faculty distributed the surveys to their students. Discussed any other issues, which need to be addressed. Continued with the interview process of participants. In the regularly scheduled meeting collected all the surveys, which were completed by the online students and forward the surveys to the independent consultant for compilation. Also the findings of the individual interviews were to be circulated and discussed at the next meeting. The problem, which was identified in this action research project, was that the failure rate for adult online students was 100 % higher on tests and assignments when comparing the failure rates to students attending courses at a traditional campus. The goal of this research project was for adult online students to achieve the same level of results as those students who were attending classes at a traditional campus setting. There would be more adult online students who would receive passing grades on tests as the current adult online failure rate of 30 % would be expected to decrease to 15% to match the rate being experienced by students attending similar courses at a traditional campus. The expected results were met in all of the three cases in that the 30% failure rates being incurred by students in online classes dropped to 15% to match the failure rates for students attending courses in a traditional setting. The withdrawal rates also dropped from 20 % to 10 %, which also matched the withdrawal rate for students attending courses in the traditional setting. In the case of late assignments an improvement was made and the late assignments rate dropped from 25% to 5 % matching the traditional setting figure. In addition to the above results being met there was positive feedback from the survey, which was completed by the online students at the end of their course. Ninety – five percent of all the students who participated in the survey felt that the pre-testing of student’s skills with respect to the software, which would be used in the online environment, was a great idea as it helped in preparing them for their course. Every participant who was new to the online course process and who completed the survey commented that they felt that by receiving an introductory tape on how online courses worked in advance of starting their course it helped them significantly in preparing for the online course experience and that the tape answered several questions which they had for example: How did attendance work? What were the assignments deadlines? Did you use APA format or MLA when completing a paper? As stated above the results and benefits derived from this research project are statistically significant. Another key benefit was that it enlightened the instructor as to what skills his/her students had or not have as he/she became aware of the demographics of the students, which is a vital component in the learning process. 85% of the students surveyed reported that they totally agreed and felt that the online learning objectives were as clearly stated when comparing them to the traditional courses held on campus while 10 % agreed and the remaining 5% somewhat agreed. 90% of the online students totally agreed and found that individual assignments ran as smoothly as assignments for traditional type courses, 5% agreed while the remaining 5% disagreed as they cited technological problems with submitting their assignments as ISP outages were a major reason. 90% of students totally agreed and felt that assignment instructions given were as effective when comparing them to instructions given in traditional courses, 3 % somewhat agreed while the final 7 % disagreed. 95% of students surveyed totally agreed and felt that the pre-testing of their computer skills was an effective method in evaluation as it gave them assurances that their knowledge level was appropriate for their online course. The remaining 5 % agreed to the process. 100% of all students totally agreed and felt that the distribution of videotapes, which explained the course prior to the start of the online process, made a positive contribution in their learning experience. 80% of all students totally agreed and found that online team assignments ran as effectively as those in a traditional environment. The remaining 20% were split with 10 % agreeing while the other 10% totally disagreed. 90% of all the online students totally agreed and approved of the evaluation method for their individual learning styles as this exercise provided them with an understanding of their individual style and it illustrated both their strengths and weaknesses in the learning process and in so doing it gave them insight to the areas where they be vulnerable while being enrolled in an online course. The remaining 10% of the students were split 5% agreed while the other 5% somewhat agreed. 92% of the online students totally agreed that the online learning experience was as effective as the traditional course environment, while 2% stated that they agreed, 4 % agreed somewhat and the final 2 % totally disagreed and felt that the traditional courses were more suited to their needs and personal learning styles. 87% of all students felt that online assessments of projects and assignments were done as effectively and on a timely basis when comparing them to traditional courses while the other 13% disagreed. In conclusion, the anticipated results were met in all of the three areas in that there was a significant decline for online courses in failure rates, dropouts and late assignments and ultimately these results mirrored the performance being achieved in a traditional campus setting which was the goal of this research paper. One major consideration is for researchers to consider broadening the scope of this type of research project to include multiple types of online courses in order to gain a better perspective of the online learning experience and how it can be improved. The first factor, which is recommended and should be considered by other researchers who wish to replicate this type of research, is that they consider adding to the process an additional survey, which would be conducted at the mid-way point of the course. By conducting a brief survey at this point it will serve to offer feedback which will provide educators with vital information as it would help them in identifying areas where improvements can be made during the online course if possible and not after the fact as most surveys tend to be conducted at the end of the course which allows for future students to benefit but it does little for the students who are currently attending. This recommendation may seem to be somewhat altruistic yet should the online course be of considerable length it would be a viable recommendation well worth implementing. The second factor that future researchers should consider when replicating this research is that they should be able to apply this research approach to a broad spectrum of online courses so that participants in other fields of study may benefit by being part of the process and have the opportunity to share their views with their counterparts. By broadening the process it makes the online learning experience more effective and in so doing it will continue to attract students and improve the overall learning experience. The third recommendation is that researchers who want to expand on this topic of online learning should acquaint themselves with the magnitude of growth that this type of learning process will experience in the year 2009 and onwards. The greatest number of high school graduates will be in the year 2009, the highest in the history of the United States and this holds true in Canada as well. Now that we know what is to be expected of us, we should realize that online learning would be the way of the future as the shear numbers dictate that we, as a society, can no longer build enough in the way of facilities to accommodate the number of graduates. In addition, factors such as convenience of learning in the comforts of your own home and not having to face traffic jams only add to the number of students who will be enrolling. Future online classes will also be totally interactive as technology has advanced to allow for this to happen. As the importance of online courses becomes one of the most important issues we face as educators, information about online course research becomes that much more valuable. As such the final results of this research report will be widely disseminated, final copies will be distributed to the appropriate Chairs, Deans, Senior Administrators and Board of Directors of the study college. Additional recipients will include the other 23 colleges within the province, the Provincial Board of Education of Ontario, Statistics Canada and The Social Sciences and Humanities Research Council of Canada (SSHRC) which is an arm's-length federal agency that promotes and supports university-based research and training in the social sciences and humanities, created by an act of Parliament in 1977. Bååth, J. (1984b). Research on completion and discontinuation in distance education. Epistolodidaktika, 1-2, 31-43. Barefoot, B. Warnock, C., Dickinson, M, Richardson, S., & Roberts, M. (1998). Exploring the evidence (Volume II): reporting outcomes of first-year seminars. National Resource Center for the First-Year Experience and Students in Transition, University of South Carolina (Monograph Series, Number 25). Bean, J. P., & Metzner, B. S. (1985). A conceptual model of non-traditional undergraduate student attrition. Review of Educational Research, 55, 485-540. Bernard, R., & Amundsen, C. (1989). Antecedents to dropout in distance education: Does one model fit all? Journal of Distance Education, 4 (2), 25-46. Boehler, T. (1999). A design plan for online distance learning program delivery. Unpublished doctoral dissertation, Pepperdine University, Malibu, California. Brown, K. (1996). The role of internal and external factors in the discontinuation of off-campus students. Distance Education, 17 (1), 44-71. Carnevale, D. (2000a). 'Boot camp' helps new online students at Boise State U. The Chronicle of Higher Education, February 18, Page A54. Available online to subscribers at http://chronicle.com/infotech/(retrieved February 5, 2003). Castles, J. (2004). Persistence and the adult learner. Active Learning in Higher Education, 5 (2), 166-179. Catchpole, M. (1992). Classroom, open, and distance teaching: A faculty view. The American Journal of Distance Education, 6 (3), 41-51. Chyung, S. Y. (2001). Systematic and systemic approaches to reducing attrition rates in online higher education. The American Journal of Distance Education, 15 (3), 36-49. Cookson, P. (1989). Research on learners and learning in distance education: A review. The American Journal of Distance Education, 3 (2), 22-34. Frew, E., & Weber, K. (1995). Towards a higher retention rate among distance learners. Open Learning, 10 (2), 58-61. Garland, M. (1993a). Student perceptions of the situational, institutional, dispositional and epistemological barriers to persistence. Distance Education, 14 (2), 181-198. Garland, M. (1993b). Ethnography penetrates the "I didn't have time" rationale to elucidate higher order reasons for distance education withdrawal. Research in Distance Education, 5 (1-2), 6-10. Garrison, D. (1987). Researching dropout in distance education. Distance Education, 8 (1), 95-101. Gibson C. C., & Graff A. O. (1992). Impact of Adults' Preferred Learning Styles and Perception of Barriers on Completion of External Baccalaureate Degree Programs. Journal of Distance Education, 7 (1), 39-51. Grayson, J. P. (1997). Institutional failure or student choice? The retention of adult students in Atkinson College. Canadian Journal for the Study of Adult Education, 11 (2), 7-30. Heverly, M. A. (1999). Predicting retention from students' experiences with college processes. Journal of College Student Retention, 1 (1), 3-11. Holmberg, B. (1995). Theory and practice of distance education (2nd Ed.). New York: Routledge. Kember, D. (1989). A longitudinal-process model of dropout from distance education. Journal of Higher Education, 60 (3), 278-301. Kember, D. (1990). The use of a model to derive interventions, which might reduce dropout from distance education courses. Higher Education, 20 (1), 11-24. Kemp, W. C. (2002). Persistence of adult learners in distance education. The American Journal of Distance Education, 16 (2), 65-81. Leighton, K. (2002). Project Summary. Report on the DLSP (C-TOOLS) Project submitted to California Community Colleges, Chancellor's Office, Educational Services and Economic Development Division. Grant # 01-153-002. Fountain Valley, California: Coastline Community College. McGivney, V. (2004). Understanding persistence in adult learning. Open Learning, 19 (1), 33-46. Miller, S. (2002). A utilization-focused evaluation of on-line tutoring for a New Jersey Community College. Unpublished doctoral dissertation, Pepperdine University, Malibu, California. Morgan, C., & Tam, M. (1999). Unraveling the complexities of distance education student attrition. Distance Education, 20 (1), 96-108. Osborn, V. (2001). Identifying at-risk students in videoconferencing and web-based distance education. The American Journal of Distance Education, 15 (1), 41-54. Ostman, R., & Wagner, G. (1987). New Zealand management students' perceptions of communication technologies in correspondence education. Distance Education, 8 (1), 47-63. Payne, M. (2002, March). Why we tanked. ITC News, p. 2. (Newsletter of the Instructional Technology Council, Washington, D.C.). Pugliese, R. (1994). Telecourse persistence and psychological variables. The American Journal of Distance Education, 8 (3), 22-39. Rovai, A. (2003). In search of higher persistence rates in distance education online programs. Internet and Higher Education, 6 (1), 1-16. Scalese, E. R. (2001). What can a college distance education program do to increase persistence and decrease attrition? Journal of Instruction Delivery Systems, 15 (3), 16-20. Simpson, O. (2004). The impact on retention of interventions to support distance learning students. Open Learning, 19 (1), 79-95. Sweet, R. (1986). Student dropout in distance education: An application of Tinto's model. Distance Education, 7 (2), 201-13. Taylor, J. C.,et al (1986). Student persistence in distance education: A cross-cultural multi-institutional perspective. Distance Education, 7 (1), 68-91. Terenzini, P. & Pascarella, E. (1980). Toward the validation of Tinto's model of college student attrition: A review of recent studies. Research in Higher Education, 12 (3), 271-282. Tinto, V. (1993). Leaving college: rethinking the causes and cures of attrition (2nd edition). Chicago: Chicago University Press. Thompson, G. (1984). The cognitive style of field-dependence as an explanatory construct in distance education dropout. Distance Education, 5 (2), 286-93. Yorke, M. (2004). Retention, persistence and success in on-campus higher education, and their enhancement in open and distance learning. Open Learning, 19 (1), 19-32.